Ziconic in his stall in John’s barn at Belmont. Zenyatta’s colts are now both at Belmont Park with John Shirreffs. Ziconic recently graduated from training at Mayberry Farm, where he was galloping every day and picking up speed. He arrived at Belmont over the weekend, joining his older brother Coz. Dottie tells us that Ziconic has a wonderful attitude about training and is one happy horse! We’ll be visiting the boys this week. Updates to come! John is the BEST!!!!!!! I am so happy that COZ and Ziconic are in his care !!! Thanks Team Z for all that you do for the fans!!! We love Queen Z and her foals. Thanks for our Hovis. He had a very good week in spite of Mum. I’ll have everything crossed that Hovis can resume trotting. Happy weekend everyone. Safe trip for all horses and jockeys. Thanks for Hovis. What would our Friday mornings be without him? Starts the day off with a laugh. Thanks, Sheena! There is always something going on with Hovis! Hope Herman the German finds Hovis healthy for trotting and cantering, all gaits faster than walking. We were made to be different-you and I. The same diversity is in nature but it never argues about who is good, better, or best. Each one of earth’s creatures goes about its own business-some yipping in the woods at night, some in high flight, some beneath water. One biological group does not look at another in abject disapproval-but all blend in a harmony that makes us peaceful to watch. At times I may see you as bizarre and you may view me as lacking intellectually, but we are still God’s creations, and it is the diversity that makes life colorful, and certainly not monotonous. God made me an Indian…but not a reservation Indian. Today is the first day of the 2015 racing meet at my local track, Arapahoe Park. I got up to light rain at 45 degrees. The forecast for today is a high of 64 degrees with rain/ thunder. The forecast really doesn’t improve until Tuesday with a high of 74 degrees with no rain. No racing on that day and the holiday weekend will be over. Is anyone experiencing a nice Spring? We can’t seem to get out of the grips of cool, wet weather. The blessing is no wildfires like we can have and we are not getting tornadoes, either. It’s been really strange here too Marty. Some days near 90, and then others that don’t even make it out of the 50s! Supposed to rain all next week too. UGH! Milo won’t have to turtle-turtle on Monday, it will be Memorial Day so we’ll all be on holiday! YAY! My boy Rivers had a work at Churchill yesterday….on TURF…..whats he doing on turf? Love the Direct TV Horse and Hannah commercial. Love most animal commercials. Favs cow commercials, roaming chicken and chicken fries commercial. Weather here has been ghastly. The blueberry bushes are super saturated and last night the temp dropped which was awful after very warm and humid days. Grass knee high. Has anyone heard any news about Steve Willard? I seem to recall that Zenny was something of a handful when she began her training. Coz is a young three yr old colt and once John finds the key we’ll see then what kind of thoroughbred he’s going to be. Geld him? NOOOOOOO. Belmont is limiting the ticket sales for the big day according to reports. Why? Agree. Animal commercials almost make me want to buy the product. Almost. Today my husband of 35 years went into a long term care facility. His dream was to see you at Belmont training while we attended the Belmont weekend in June. He loved your mommy so much and was blessed to meet her at the BC fences the day after your race. we have waited so long for you , a Tapit/Zenny baby, I will always have you in my heart right next to your mom, just as your mom’s races saw me through his strokes in 2009, you my darling boy will see me through this time. It must be the hand of God that puts your MOM and now you in my life to see my heart through the tough times. I loved you from conception and I love you still with all of my heart, a thousand kisses sweet baby boy, I hope to get to Belmont and catch a glimpse of you training. You are truly blessed . Sending you my thoughts and prayers at this difficult time. Hope things improve for you and your husband, and that you can get to Belmont sometime soon. May God bless. sheena–Add my voice to yours. How exciting that Z’s sons are together and they will be getting visitors. I have a lot of pictures of them in training and they look great. There were a couple of pictures of Ziconic prancing with his leg up like Mama Z and I was amazed. He has her sense of dance. We will have to see how it develops. Love Team Z and the boys! Wonderful news. Happy they are together. Cute picture of Ziconic. I spent a long time writing a post on Ziconic, and looking for some pictures and videos of him, like we did Coz. I asked for it to be taken as it was written, with love, and hope for the future. The post went up, but when I came back to see responses, it was gone. I love this site, and can’t believe that this happened. I didn’t say anything wrong. It’s like a stab in the heart!! I have egg all over my face; SO SORRY!!! I posted the one I was talking about under the pictures of Coz, and the last post under the one with Ziconic in the stall, because I was looking on the wrong day. Should have known, I guess I’m paranoid, because there is one site I belong to, that do not like it if you say anything questioning to them, and they would have taken it down. I’m truly glad your not that way!! 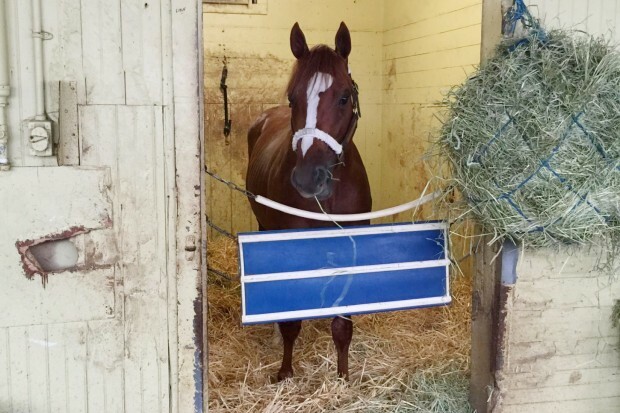 So thrilled to hear Ziconic is at Belmont! Even better Ziconic & Coz are together!!!! Hoping all goes well with their training & believe they will be successful. Thanks for the photos, updates……truly appreciated. Can’t wait to see Ziconic race wonder if he would probably be racing against his brother Cozmic race against eachother one day. How did that race on the 4th go for Cozmic? Did he do ok? Ziconic appears to have more of an aggressive attitude to other horses than does his brother; hope it kicks in on the track.